Additionally, its functional strap and featherweight design make it one of the most portable electrical safety analyzers in its class. Heavy-duty switches allow users to effortlessly change polarity and configuration of the neutral connection between open and closed, while push-button operation ensures fast transition between tests for complete basic testing in minutes. The ESA609 integrates all functions needed to test medical devices when patient lead testing is not required, including: line (mains) voltage, ground wire (protective earth) resistance, equipment current, leakage current and point-to point tests. 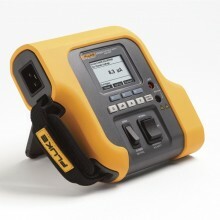 Click the button below to add the Fluke ESA609 Electrical Safety Analyzer to your wish list.